Marie (Yi's friend? ), you'll have to wait a while till I get into the mood to do chinese firepot/steamboat. But I did a simple Japanese firepot tonight and I hope you'll try cooking it too. 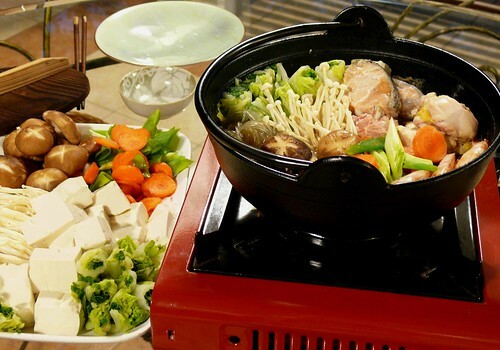 Yosenabe is one-pot cooking (there's also sukiyaki, mitzutaki, teppanyaki, shabu shabu, all one-pot table cooking) at the dinner table, and it is a great way to eat with close friends and family. Be careful. It's so good and fun, you can eat till everything is finished and you can't walk straight. That's why we are lying around like seals instead of going out to watch the Merdeka Day fireworks. --mix above to make a light stock. --mix together. this is 'ponzu' sauce, for eating seafood. Serve Japanese 7-spice powder on the side. 1. Cut cabbage, separating the harder stems from the softer leaves. Blanch spinach and leaves of the cabbage briefly. Squeeze water out. Lay the spinach over the cabbage and roll up. Cut into 2 cm lengths. 2. Arrange the ingredients nicely in a flame-proof ceramic or Japanese iron skillet. Do not overload because you can cook in batches. 3. Put skillet onto a table top burner, add some stock, cover and boil. Eat the chicken last as it takes longer to cook. Add water or stock as you continue cooking the next batch. This is not sukiyaki; stock should be light, not too salty and should just cover the veg and meat. Note: Each person should be given his own scoop and ladle. Serve rice with yosenabe. Whenever my kids walk out some store holding their drinks or icecream, or whatever, sans plastic bag, I feel a sense of pride. I've taught them to abhor plastic bags and they can recite (with eyes rolled up to their hairlines) "plastics don't biodegrade, plastics are carcinogenic and we have to think of the next generation." I feel so guilty everytime I shop. One shopping trip will garner at least 5 or 6 plastic bags. That's just one trip, one person. The worst are bakeries, who put one item in one bag, then bag all of them again. I tried using green bags but they don't carry big items and wet market items so well. 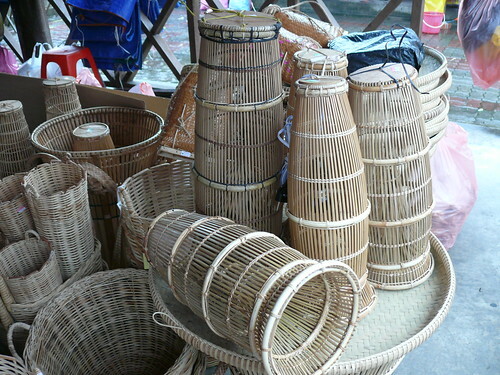 Recently I've taken to using a rattan basket, like how my mom and her generation did. I hope to convince people to cut down on their use of plastic bags, for their own good and that of their children. And everybody's. It is more troublesome to go green. Sometimes I forget the basket just as I'm paying and go back to the car to get it and I know what the people are thinking: she's crazy. 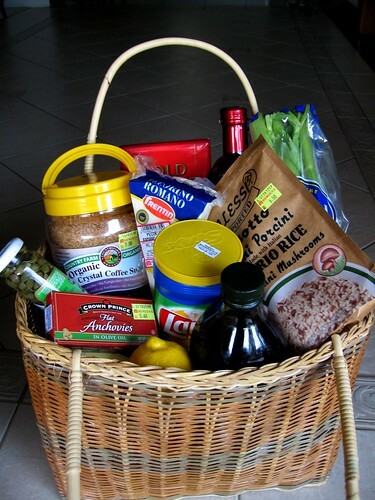 But many times they agree with me that it's better to use a basket and really, you can put all the shopping in one basket that normally requires 5 bags (one for meat, one for non-food items and so on) and it's much easier to unpack. And you don't get a whiff of the plastic bags that you get when you fold them away. Have you noticed that some plastic bags, the thicker ones, smell really strongly of plastics? Avoid them like you'd loan sharks. Yes, I am an unofficial consumer's advocate. The book that first frightened and prompted me was one I read as a freshie, a book called 'The Silent Spring' by Rachel Carson. The one point I still remember was her claim that everything we eat has pesticides (DDT I think), including mother's milk. I was shocked because I was so ignorant. And that book was written maybe in the 60s, way before Al Gore and all the green people. Has the world learnt from Carson? I don't think so. Let's do our part, friends! *According to CAP's booklet, Britain's Ministry of Agriculture, Fisheries and Food (MAFF) did a study and found that many brands of baby food contain phthalates. 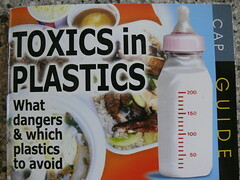 It was estimated that a newborn would receive on average 0.13 mg/kg body-weight per day of phthalates. One phthalate, BBP, can reduce sperm production and testes size at levels of 0.1 mg/kg. Ouch. And baby feeding bottles have Bisphenol-A which can leach out and again cause abnormal prostate development, lower sperm count, early onset of puberty in females etc etc. You get the point. The net service was out today and I was so restless I contemplated making fresh pasta. Opted to make pesto sauce instead. My basil plants have grown so old that all I could salvage from them was about 1 1/2 cups of leaves. I used to whizz everything in a blender to make a few bottles to store in the fridge but they don't really keep well so now I make a fresh batch whenever I need it. For small amounts I usually use the pestle and mortar, which smashes and releases the flavor of all the ingredients rather than cut them up like the blender does. 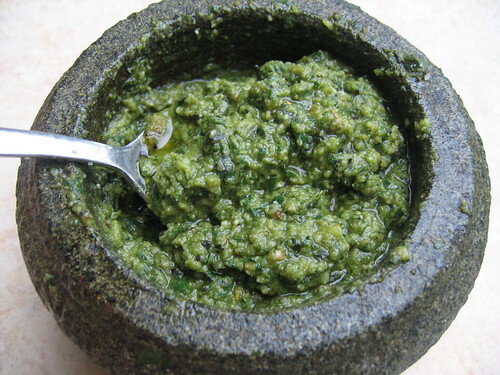 You can make your pesto according to your liking, adding more pine nuts or basil or EVOO. I don't bother to measure anymore and I think that's how pesto should be: adjust the ingredients until you get the sauce you want. 1.If using blender, whizz everything together. Adjust taste with salt, pepper, oil and cheese. 2. 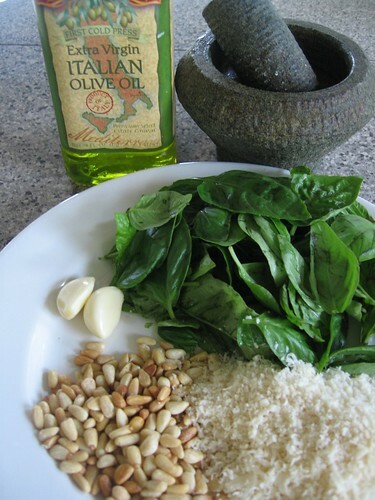 If using mortar, just pound the garlic, nuts and leaves and add the salt, pepper, oil and parmesan to taste. 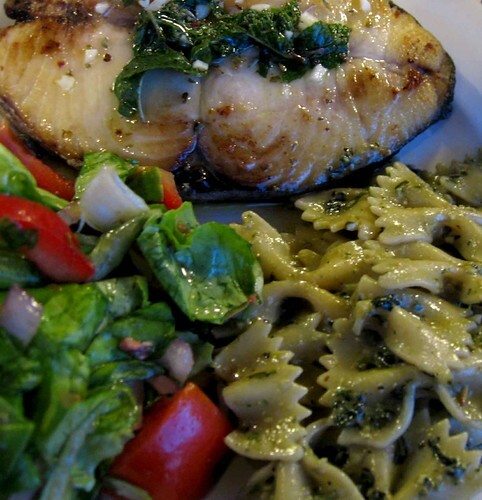 Use sauce with pasta (boil pasta in salted water, drain & toss with pesto sauce & top with grated pecorino cheese). Or use for bruschetta. This is the most exotic durian I've ever come across. In fact I brought it to my regular durian stall and the durian experts too have never seen it before. I gave him half a fruit and as we drove away, he and his friends started eating it and I found it amusing to see them nodding their heads, approving it. 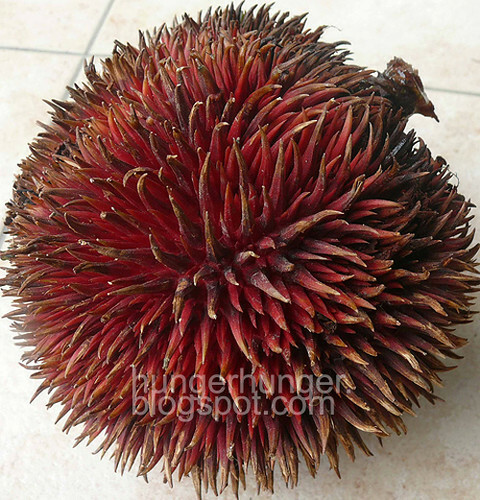 Ming's friend Dalhousie gave us two of these red durians that someone else gave his parents. These durians don't smell anything like the usual durians. Ming said he and his friends agree it smells like Elephant Super Glue and bubble gum. I'm not sure if I like or dislike the smell but Hub, who loves durian, ate one seed and declared it "the worst tasting durian." 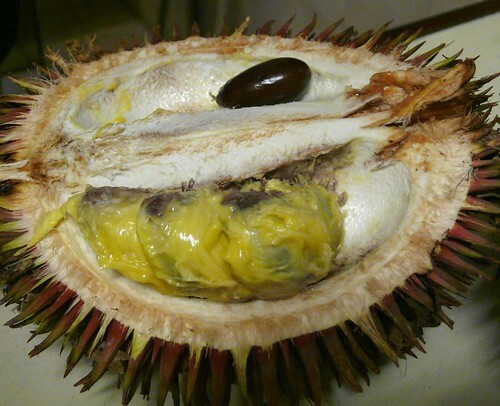 Ming and I ate eagerly, knowing a rare thing is a precious thing but honestly, I see why horticulturalists have to come up with durian hybrids. 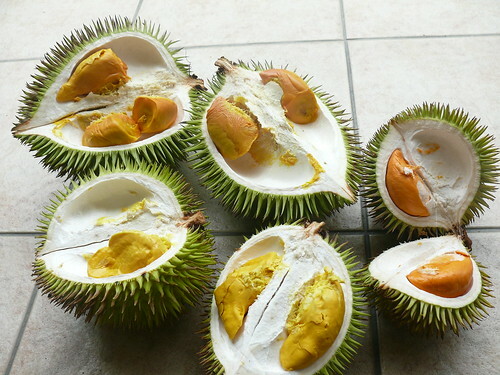 If all durians were like these ones, I think even the jungle animals won't eat them. 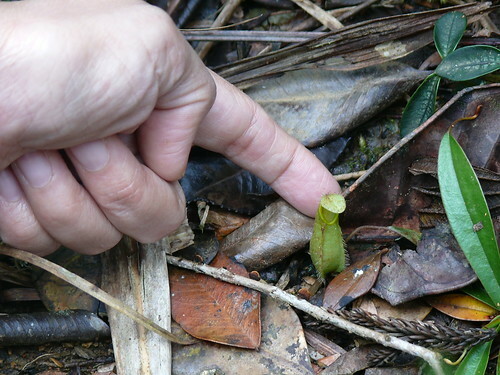 The thin flesh is a bright yellow color and is very mushy and very sweet. 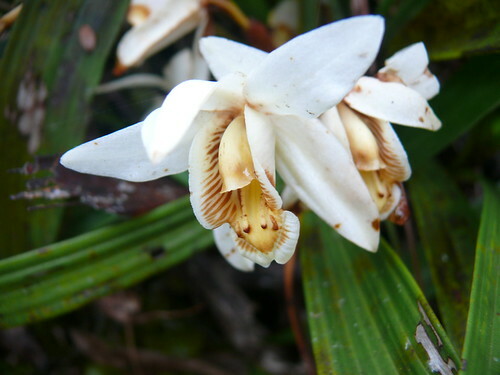 The smell however is extremely strong and unusual. The seed is a deep brown color and the shell oxidizes very quickly. A most strange durian. I'm amazed. 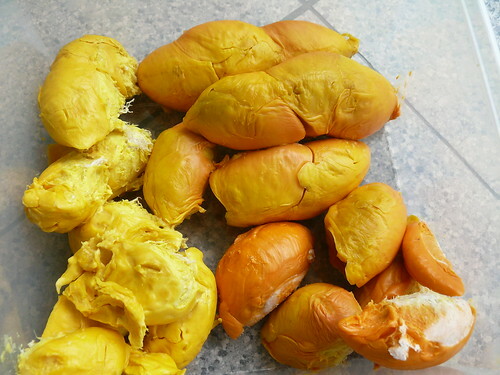 Anyone out there ever eaten this durian before? I think I'm getting closer to that mythical purple-flesh durian. You'll never find me buying wieners/franks for my kids. Well, maybe once in 2 years. And because of that, Wey can't get enough of wieners. The worst things to eat, as far as I'm concerned, are locally made burger patties which are orange on color. I will dig them from his mouth if I catch him eating them. Whenever I see mothers feeding their kids wieners (which is a popular birthday party food here) or buying them in supermarkets, I have to control myself from telling them off. Please, please, do not feed your kids wieners like it's a health product! When I was pregnant with Yi, I read a newspaper report (in the Daily Express, from some reputable source, not National Enquirer or the like) about this woman in England or the US who miscarried her baby because she had been eating wieners daily for sometime. Researchers warned that the sodium nitrite (a proven carcinogen) used in preserving and giving cured meats a pink color were to blame (if the sausages are brown after cooking and not pink, you know there's no nitrite in them). I never liked wieners from the supermarket anyway (but I do love those from the deli...) so it was easy for me to give them up. Fresh sausages are a different thing. JW Marriot in KL used to have a deli in the basement floor and the sausages were just YUMMY. In KK we only get fresh sausages (sausages are divided into 3 types: fresh uncooked sausages such as Italian and fresh pork sausages which do not contain nitrite so they must be consumed within 3 days, cooked sausages like wieners and cooked bratwurst and fermented sausages like pepperoni, stick-jerky sausages, hard salami etc) in Tong Hing or Consfood and these brands are either Primo from Australia (expensive and not very good) or KL-made Gourmet, which just don't make my standard. Last weekend, a friend, M, gave me some sausages he'd made. 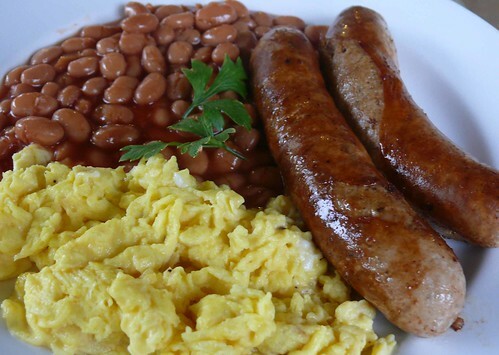 He not only omitted nitrite but also the fat traditionally added to make sausages smoother, juicier and tastier. He has an Austrian neighbour (bless all neighbours who teach us their home-cooking) who has shown him how to make fresh sausages. M's home-made sausages were tasty and flavorful (esp. the Italian sausages) but the texture was coarse because it was so low in fat. I always choose health over taste so it's okay. The boys are so deprived they didn't mind too. M said he's willing to take orders. Call him at 088-244 918. When I was training with the Korean Development Bank years ago, most of the invited delegates from the rest of South East Asia hated Korean food (but I loved it) served in the Bank's cafeteria because a typical lunch was mainly rice, plain soup and lots of Korean pickles. Most delegates ended up eating kalbi, bulgogi and samgaetang in restaurants. W and I particularly loved samgaetang, because it was so delicious and we get a whole chicken each for only about RM15 (US$4). I think we ate this soup, in the middle of summer, for 3 straight weeks. W immediately ran off to Canada to get married, so invigorated was she by all that ginseng and chicken. I had my third child. Now you know why this soup is served for all Korean newly-weds by their anxious mothers. It's been raining recently so soup is a must at the dinner table. I was blessed with a big home-reared kampung chicken ("They fly, missus!") by Vero, my maid, so I decided to cook it whole and this recipe is best for that. 1. Do not trim too much skin off the chicken's neck and tail end because you want some covering for the stuffing. Put 1 ginseng root into the neck cavity of the bird to stop the rice from coming out, then some (drained) rice, 2 or 3 red dates, rice again till cavity is almost 3/4 full. Using a wooden skewer, sew up the cavity. If you find there's not enough skin to cover, use the liver or giblet as a stopper so the rice won't spew out (rice coming out means you didn't do a good job) . 2. Boil water in a table-presentable pot, such as Corningware or some cast iron pot. Put the chicken in, carefully, thigh -side up, and add enough water to just cover the chicken. Not too much water or too big a pot or the soup will be too diluted. Add everything else, cover and simmer at least 1 1/2 hours or till chicken is so soft the thighs come off easily, but not so soft the meat has come off. When you check on it once in a while, move the chicken so the bottom won't stick. Skim off the oil. Soup would be cloudy-white, not due to the rice but the other ingredients. In an oilless wok, add salt and pepper and fry over low heat till fragrant. Dish out into a small saucer, add the sesame oil if using. This is the dip for the chicken. Serve it in a tiny saucer for each person. However, you can just add it to the soup or even leave the soup unsalted like I do. 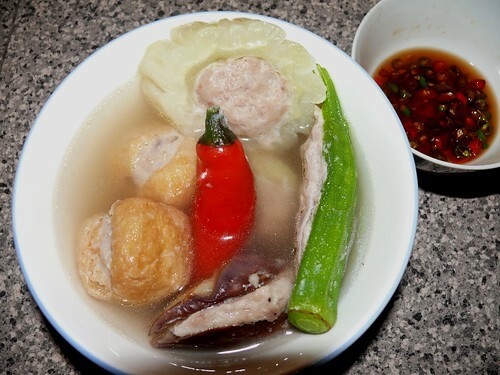 Put some chicken, some rice stuffing and soup in individual bowls and sprinkle spring onions on top. Yum. 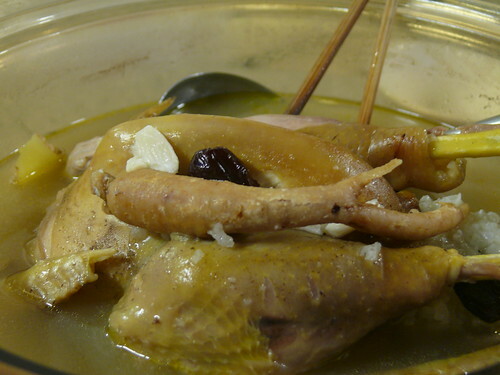 * Using home-reared, mature (but not old) chicken is important for samgaetang, which is a health-strengthening soup. In Korea, small chickens are used so each person gets one whole bird. **My Korean neighbor gave me fresh ginseng roots once, and they were very different, much better than the dried roots. Meeting the frustrated discipline master (solution: act more upset than him). Skipping tuition to play at the cybercafe (I tell the cyber people I'm calling the police and walk out before child disowns me). Calls from the tennis coach (tip: as per discipline master). Juice cartons in bed (stop buying). Empty plates, in the fridge (throw a fit!). Missing things (ground everybody, including Hubby!). Dirty clothes, outside the laundry basket (let them rot). Red marks on report cards (threaten boarding school. May backfire. "Really, mom? When do I go?!"). Compliments on my cooking (all's forgiven). My favorite shampoo and shower gels gone (switch the bottles; they'll end up with mine which is really meant for them). Never coming home on time (let him sleep in the car. Works). Gruff "Good Morning" and reluctant "Hi mom. "(make him repeat it. In a nice tone too). Using my handphone without permission (haven't found a solution yet). Not coming to dinner because The Simpsons is on (no dinner for him and throw all leftovers). Dirty feet on my beige sofa (switch TV off). 3 seconds shower, 1 nanosecond toothbrushing (let their friends tell them). Not flushing (let them breathe their own mess). Kiss on the cheek, holds my hand in public (love you too!). There must be more to motherhood than the same reason everybody gives me: God is moulding you through them! Grrr!! 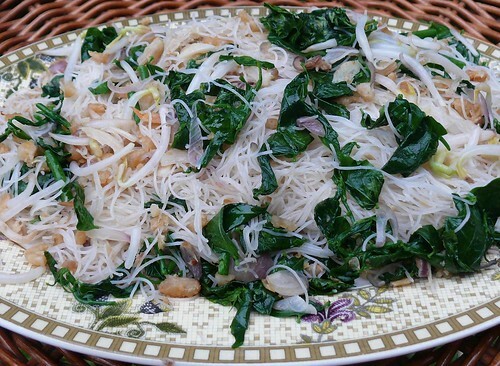 I don't normally post on weekends, but because K, a friend who lives in Ohio, USA has sent an urgent request for a fried mifen (rice vermicelli/noodles) recipe for a friend, I've cooked it for dinner tonight so I can post it by the time she gets up to read this. Also, I can't resist fried mifen especially home-fried using little oil. 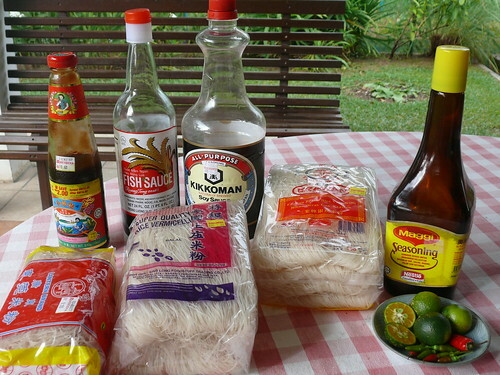 Right: My favorite dip for mifen, fried fish, almost everything, is made with Maggi sauce, bird's eyes chili and calamansi limes. The regular mifen from China is not good for frying because it breaks up easily. However, if I cook soup mifen, I only use the Chinese mifen because it doesn't break up in soup (no stirring/frying) and it is more fragrant and silky. For frying, I recommend using the very thin, long mifen from Thailand or Malaysia. Using chopsticks won't break the noodles. This amount of mifen in one go will not give much wok hei (heat of the wok, which gives a much-desired char flavor) so do fry in smaller batches. Restaurants fry better-tasting mi fen because they do so in small portions for one person, so that the heat of the wok is always high. 1. Never follow the instructions on the packet that tells you to soak the mifen in hot water. What you'll end up with is a soggy mess of broken strands that'll clump if you fry them. Always soak in room temperature water till it's soft. This may take more than an hour in colder weather. 2. Try to toss the mifen with a pair of wooden chopsticks. Using the ladle usually cuts the noodles up. 3. My mom has taught me to dilute the soy sauce and oyster sauce with water because if you add these sauces directly into the noodles, it's hard to get them to coat the noodles evenly. 4. It is better to fry mifen in smaller batches because it'll be easier to toss/fry and also it'll taste better with more 'wok fire'. I have used very little oil but you can add more. 5. Mifen is made of rice flour only so you must enhance the taste by adding oyster sauce or msg (restaurants use msg by the spoonfuls but you just need a couple of shakes. Nobody in China gets headaches from eating msg, as Jerry Steingarten will tell you. You only get thirsty if too much is used) on top of the soy sauce. 6. Fry in small portions to get better flavor. I have fried tonight's mifen 3 ways. 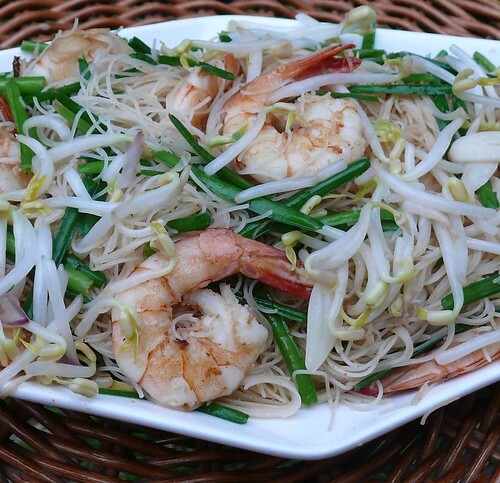 The first is with prawns and lots of Chinese chives and bean sprouts. Beef flank, cut into thin strips would be even better than prawns. 1. Put 2 T oil in a wok, add the prawns/beef and fry in medium heat till 3/4 done. Now increase the heat and add the chives, beansprouts and 1/2 t salt and toss quickly for 1/2 minute. Remove. If wok is dirty, wash it. 2. Heat wok, add 3 T oil (more if you like) and the garlic and fry till fragrant but NOT brown. Add the mifen, turn heat down to medium and pour 1/4 of the sauce over, and fry using chopsticks to lift the noodles up and a frying ladle to scrap the bottom of the wok so noodles won't stick. Take a bit of noodles and taste for doneness (should be soft not hard) and taste, adding remaining sauce as you fry. Turn heat up if it's too low. Fry till all water is absorbed. 3. Add the fried meat and veg to the mifen, turn fire up, toss well for a minute or two, and dish up. 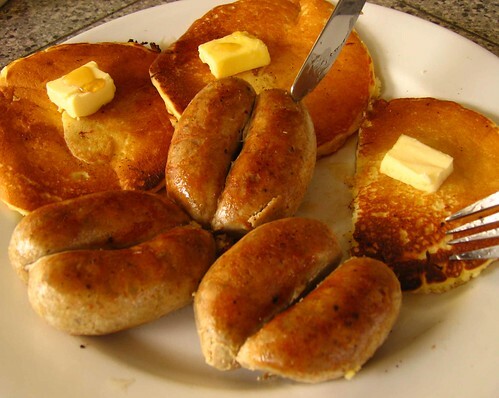 --same as above except use BBQ pork and meat roll, cut into fine strips. 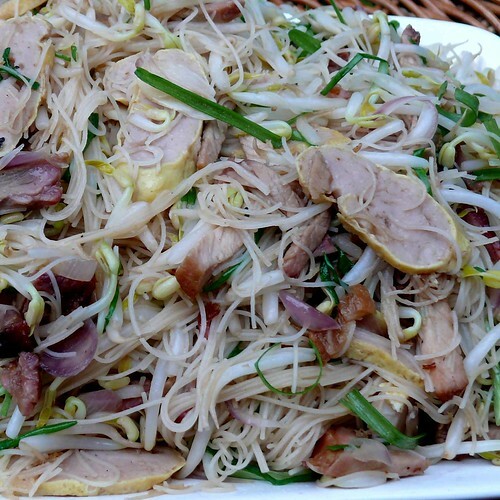 --Fry the beansprouts in a little oil and salt till half-cooked, remove. Then fry the mifen the same way as above (you can add some BBQ sauce) and add the BBQ pork, meat and sprouts last. --Scatter some omelette strips on top as garnish (I forgot to do that). Now the next one is sure gonna make you homesick, K! 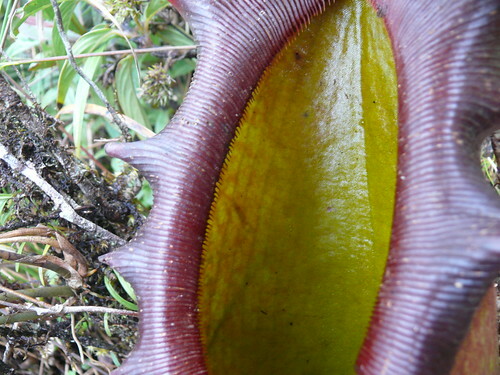 Bet you are drooling on your keyboard because there's no Sabah veg (yummy!!) anywhere but Sabah ( and sometimes in West M'sia)! 1. Heat wok up, add 4 T oil. Now add the dried shrimps, salted fish and onions and fry till golden and fragrant. Scoop everything out but leave the oil in the wok. 2. 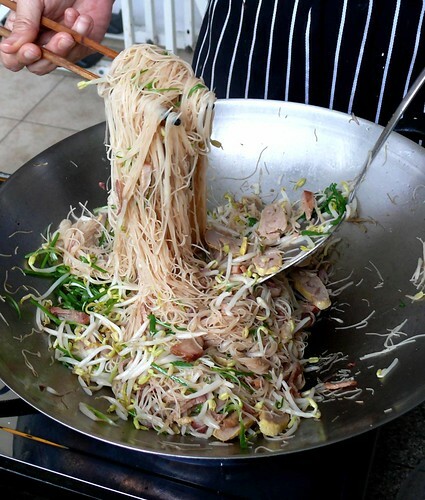 Add another 2 T of oil to the wok, add a good pinch of salt and add the beansprouts and veg. Fry till half-done, then add the mifen. Quickly add 1/3 cup water and the fish sauce and toss well. Add the salt, pepper and msg. Keep frying till all water is absorbed. The mifen should be dry. 3. Now add the fried shrimps/salted fish and toss well, adding more seasoning to taste. Test the doneness of the noodles, adding more water to make them softer if necessary. Add chilies last and dish up. Note: Add a little dark soy sauce if you like a darker mifen. 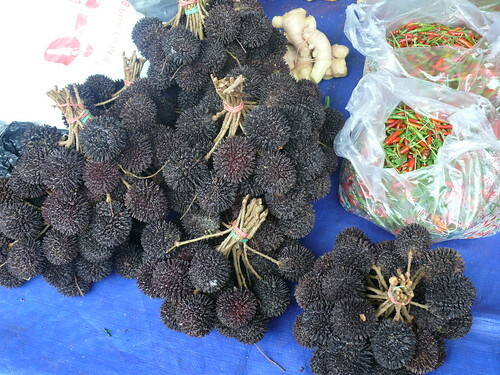 Remember those deep-red 'ribena' buds in one of the photos in my post on the Donggongon market? 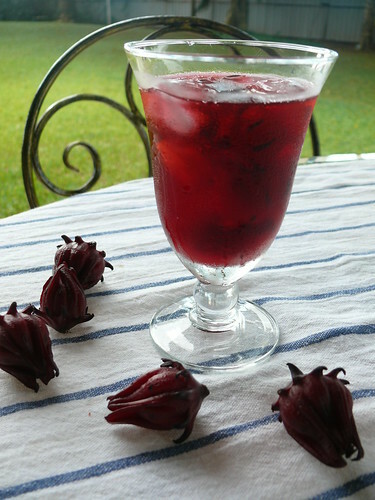 They are actually a specie of hibiscus, just like the okra or ladies' fingers (the veg, not the sponge fingers), that are found in almost all tropical countries from Jamaica to India to The Philippines. Those bud-like things are the calyx left after the petals have fallen off, and they can be made into wine, thrown into salads and even fried. I boiled the roselle calyxes in water with some sugar, cooled it and left it in the fridge. It's been there nearly a week. I tell the boys it's rich in vitamin B and iron but there are no takers so far. The drink looked pretty, like a good red wine, but it was sour and there was no particularly distinctive flavor, except for what I imagine dried leaves would taste and smell like if you boil them. So don't try this at home. 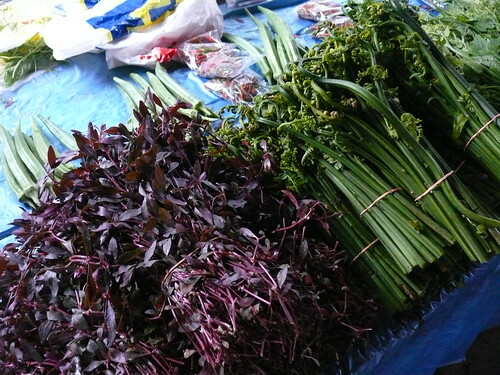 On the way up the mountain, you'll find little stalls with some jungle or home-grown produce. Sometimes nobody tends the stall and there's just an old tin for you to place whatever amount of money you feel you should pay although these days it's rare to find these stalls. 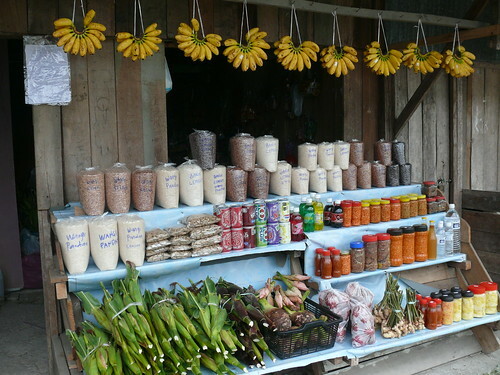 A stall selling glutinous corn, yams, sweet potatoes, ginger, hill padi (rice), bananas, canned soft drinks and pickles. 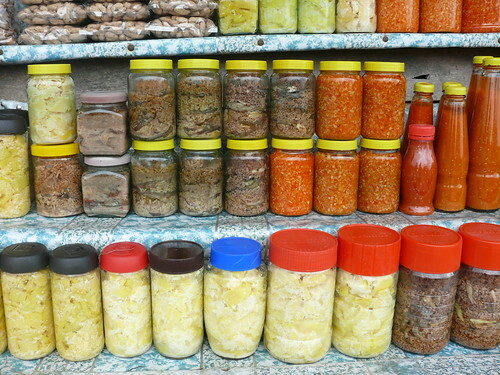 The light yellow jars are pickled unripe bambangans (a fruit) and the red jars contain fiery hot chilies. I took a closer look at the brown jars and stepped back in horror! Tiny river fish pickled in garlic, salt and uncooked hill rice! Two of the bottles definitely looked long gone, decayed and dissolved. How old are they, I asked and the lady said they were 3 weeks old and that they taste great with rice. No thank you, I'd rather drink drainwater. 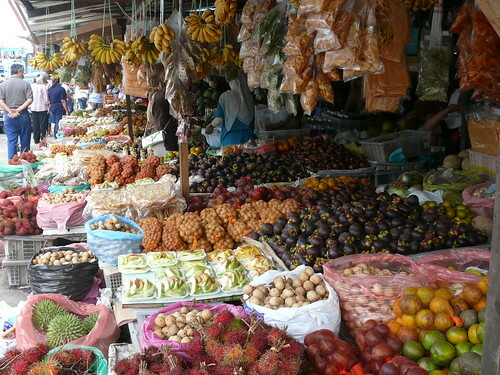 Look at that amazing spread of tropical fruits! I bought that whole bag of wild durians (lower left) and the 2 1/2 hour journey home was dizzying. Most of us passed out except for Hub who had his window down. The only place for a decent meal in Mt. K, as far as we're concerned, is at the Fairy Garden Hotel/Resort. But be warned, don't order that lemon chicken. This is another tried and true recipe from Liz. I have changed the cooking method slightly. 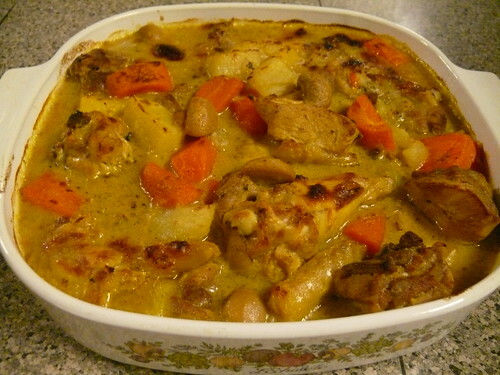 Kids love it, I think for its creaminess and flavor and the fact that it looks like curry yet is not hot at all. 1. Mix the tumeric into the chicken. Fry the chicken and onions in a little bit (2 to 3 T) of veg oil for 4 to 5 min, add the potatoes, carrots, mushrooms, water, salt and pepper and simmer 15 min. 2. In a pot, put in butter, then turn heat on to medium (so butter won't brown) and when butter has melted, add the flour, stirring well. It will form clumps but continue to fry it under low heat for 1 min. Do not let it brown. 3. Add the coconut milk and the Ideal milk a little at a time, stirring well, till a thick cream is formed. Add the cooked chicken, stirring well and season to taste. Let the sauce bubble, then let it cook about 5 min and switch off heat. 4. Switch on the top grillimg element of the oven to the highest temperature. Spoon chicken into a glass or ovenproof dish and grill till lightly browned. Good with rice or French bread. * If it is inconvenient to get fresh coconut milk, it's ok to use box or canned coconut milk for this recipe. Made a huge pot of this recently when we felt a little over-whelmed with fried and stewed food. Ming likes soupy dishes and this was perfect for him but Wey didn't touch it because it's too bland for him and he hates fish. The stuffing is 50% fish (spotted mackeral, the type that makes springy fish paste) and 50% lean pork. Traditionally, the Hakkas use an all-pork paste for this dish, and a piece of pork skin is laid over the base of the pot for that extra flavor, plus to prevent the stuffed veg from sticking to the pot. 1. Scrap the flesh off the mackeral using a metal dinner spoon. Discard the skin. Add 1/2 t salt, 1 T water and a few good shakes of pepper. Using the back of a chinese chopper (the knife, not the thing that flies), give the fish a good chop till it's well-minced. Now put it in a small bowl and swoosh it round and round in one direction with your hand. Or you can scoop the fish mince up, slap it against the chopping board many times, hard. After several minutes, the fish paste will have a shine and be quite stiff, not mushy. Now mix all the above ingredients together. 2. Fill the meat paste into veg like peppers, bittergourd, okra, brinjals, and tofu or tofu balls. 3. If you want it soupy like I did, just boil some chicken stock (or use chicken buillion cubes), add the tofu balls first because it takes longer to cook. Then after a couple of minutes, add the other veg, starting from the hardest to cook to the fastest. Bet it boil, test one tofu ball to see if it has cooked through. Season to taste and serve with a good chili dip. One dip I love is fresh bird's eye chili (or the hottest you can find such as hanabero), a squeeze of calamansi lime and some Maggi soy sauce. 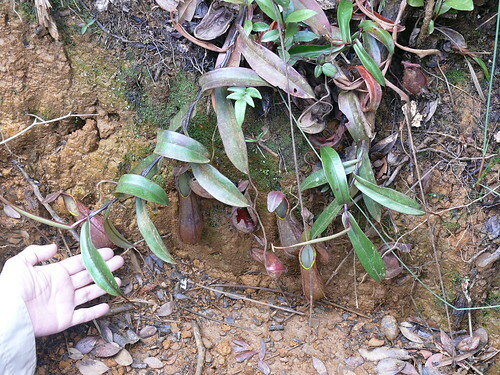 Pitcher plants, belonging to the Nephentes family, are called 'periuk kera' or monkey cups. The cups hold rain water which monkeys and other animals drink. On our visit to Mt Kinabalu last weekend, we chose to take a guided tour of The Nephentes Trail which took us up from 2000 m to about 2150 m in the jungle. 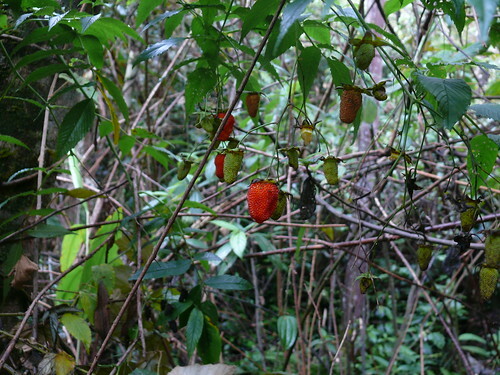 True to its name, the trail was scattered with monkey cups of different sizes and colors. 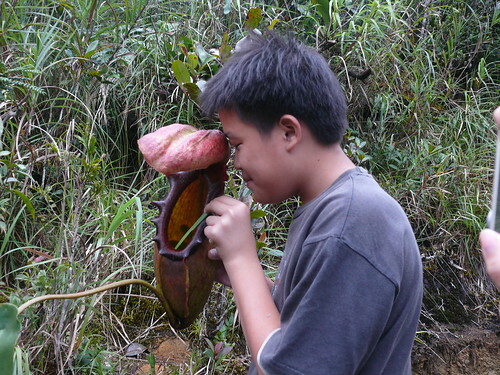 According to the guide, the largest cups found in Mt K are about half a metre! Tiny animals such as shrews and other rodents drown in the water and are dissolved by the slightly acidic water as they rot, and so the plants get the nutrients they need as the soil at this elevation is poor in nutrients. The lid of the cup attracts insects (esp. 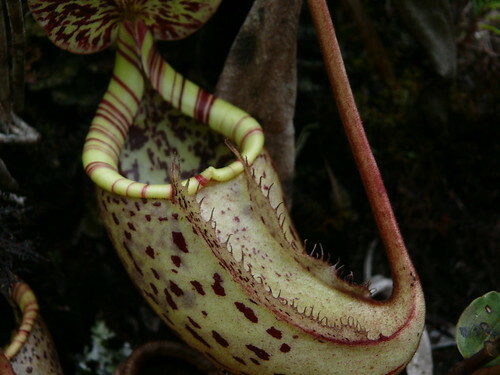 ants) and small animals, by excreting a sweet nectar. The ants come closer, and because the rim around the cup is smooth, they slide into the cup and drown in the water. Even if they make it up, they can't escape from the cup because there are tiny thorns around the rim of the cup to stop them. Very sinister design. Did you know that Mt Kinabalu was so named because of a romantic but tragic story about a local Dusun woman who waited for her Chinese prince who promised to come back for her but never did? She looked out for him, day after day, from the highest point of the mountain, till the cold killed her and turned her into a peak. If the story is true, we should have lots of mountains around. Kinabalu is the local pronounciation for 'Cina balu' meaning Chinese widow. The Kadazans-Dusuns (the biggest indigenious group in Sabah) who live in the mountain valleys as veg farmers, regard this mountain as sacred. I think all Sabahans love this mountain for its cool climate, diverse vegetation and its awesome rugged beauty, and the fact that we were brought up (erroneously) to know this mountain as South East Asia's highest mountain, until recently when accurate measurements demoted it to the 3rd highest at 4095 m. Every Sabahan will climb Mt K at least once in their lifetime. I climbed after finishing high school, and I've never forgotten it! To climb the mountain now you have to book 6 months ahead because of the large number of climbers, plus the authorities are more careful about maintaining the environment. We stayed at one of the Crocker lodges in Mesilau Nature Resort, which is smack at the side of the mountain, about 2000 m up. If there's a place for you to get away from the madding crowd, this is it. There's no TV in the lodges, food at the cafeteria is 3/10 (I tasted decayed chicken in my noodles. Wey had the hardest piece of Chicken Maryland. ), the temperature drops to 13 C at night and the air is pure oxygen. 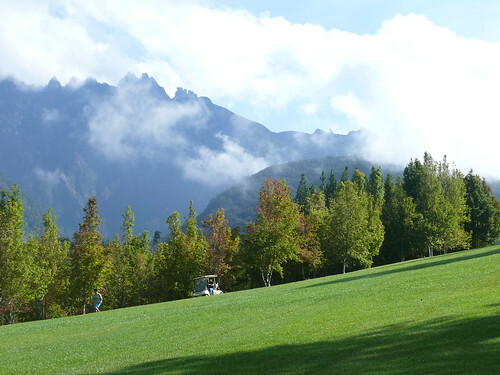 For RM30 (US$9), you can drive your own buggy around this 9-hole golf course situated about 1800 m. The temperature was cool (24 C morning), air was fresh, the view beautiful yet we were the only visitors. 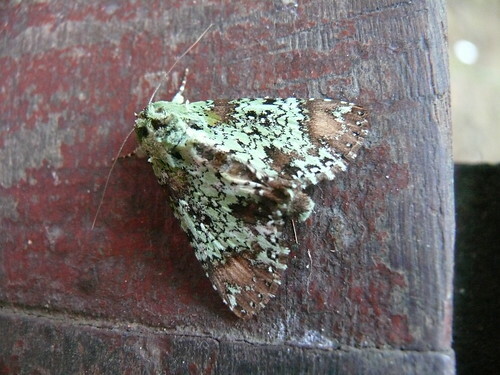 Pretty good camouflage, considering Hub moved it out from our room to the open. We took a 2-hour nature trail, the Nephentes Trail, that was led by a knowledgable Kinabalu Park guide called Bin, for only RM5 (US$1.50). 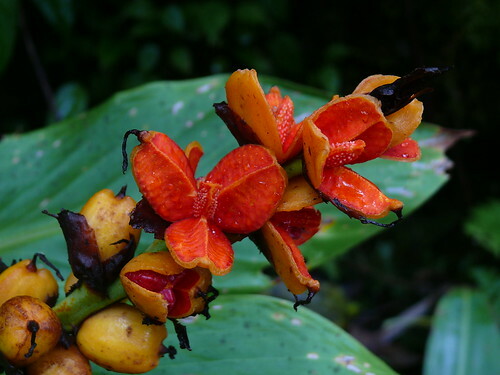 A specie of the Rosacea family, found at around 2000 m.
There are about 80 species of ginger in the Mt Kinabalu park. 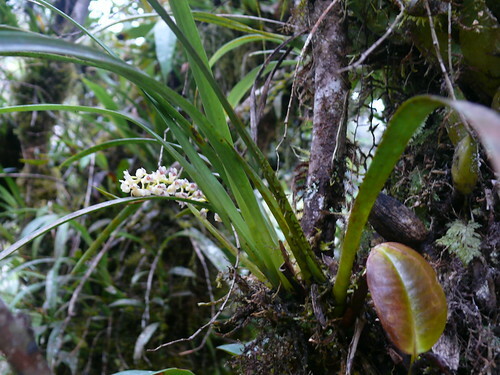 The orchid family has the largest number of species among plants (estimated upto 30000 species in the world) and there are hundreds in Mt K.
Our smallest orchid has been upstaged by one in another tropical forest--The Amazon in Brazil. 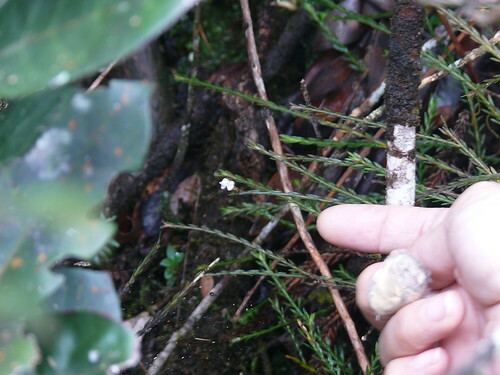 There are many epiphytic plants (plants that attach onto other plants, not necessarily parasitic in nature) in Mt K.
Nice smell if you pinch the leaves. Somehow the smell reminded me of the sausages I ate in Perth, Australia! Guess I was hungry (all that climbing). 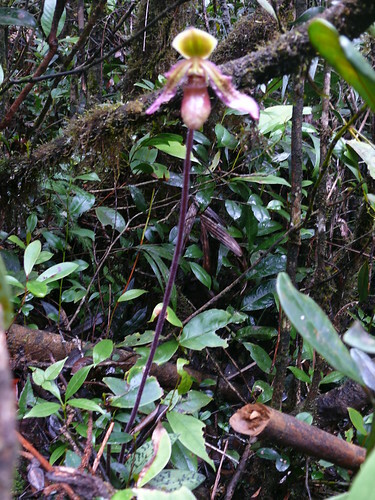 Slipper orchids are very rare and protected species. Unfortunately I didn't get a good shot. 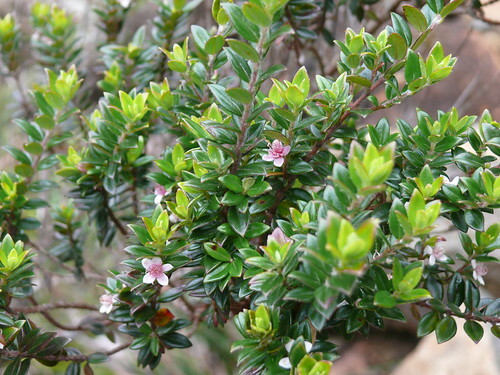 We always wondered what tree or plant gave off that peculiar but pleasant herbal scent in the Mt K area. 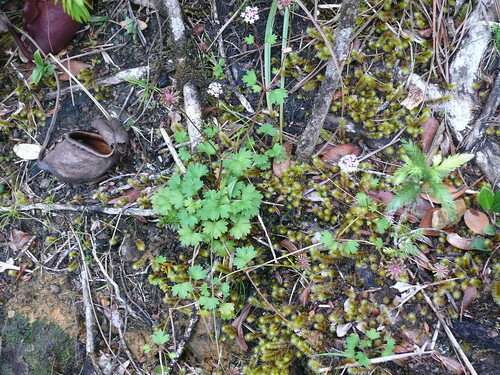 Well, the guide tore the old/mature leaf of this plant and told us this is a kind of wild celery. I don't remember the scientific name, but I recognised the smell (not quite like celery)immediately and I'm so glad the mystery is solved. 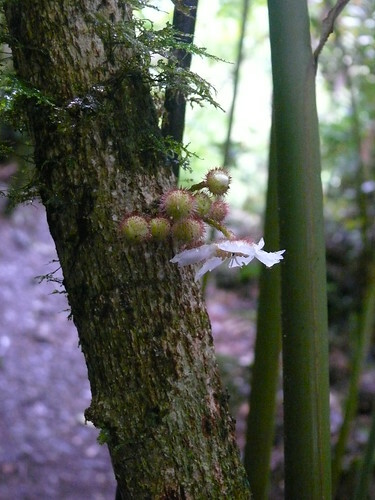 Another epiphytic plant. So beautiful. 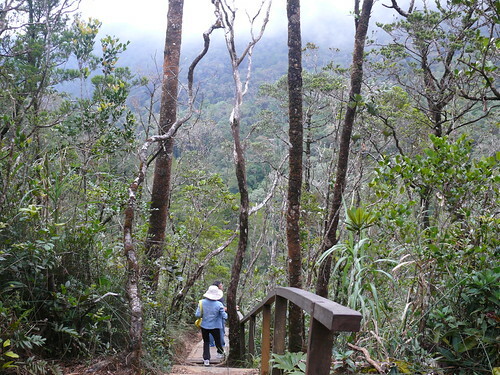 The vegetation goes from a tropical rainforest (big tall trees, thick shrubs and overgrowth) to a montane forest (craggy trees, moss and lichen, and epiphytes) to alpine meadows as you ascend the mountain. At the top, there's no vegetation because there's no soil but granitic rocks and the temperature hovers around 0 to -1 C. I looked at the mountain, heavily covered by rain clouds, and I was so glad I wasn't one of the climbers that day. 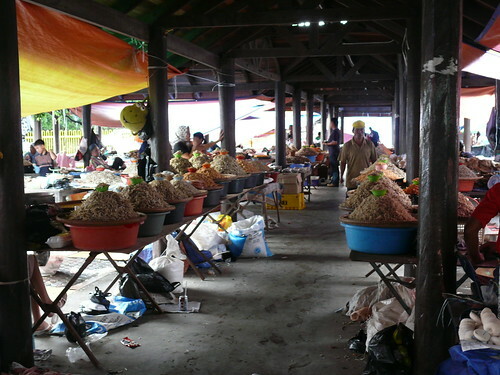 The tamu is a weekend open market where native people bring their produce and harvest, either home-grown or picked from the jungle/wild for sale, much like a farmers'market. The best time to go is Thursday morning, when everything is fresh and abundant. The natives camp on the tamu grounds until Friday and by that afternoon most things would be gone. I brought a friend from China, Leiyun, to the Donggongon tamu this morning. It had rained earlier so the market was cool. 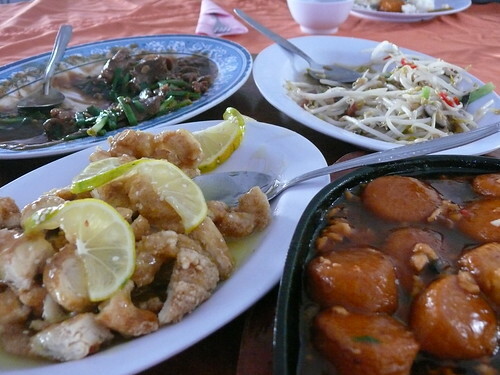 Leiyun enjoyed discovering all the exotic vegs and fruits, most of which she has never seen before. And neither have I. The tamu is a great place to take pictures and I just wish I could do justice to the place, but unfortunately it was dark and I still haven't learnt to use all the modes in my camera. All kinds of tubers, roots and veg laid on the floor. 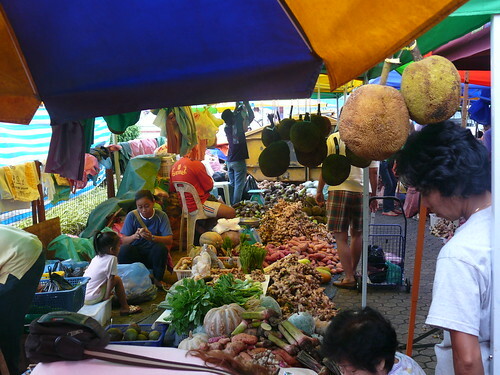 Prices are much lower than the regular markets. This section sells all kinds of dried fish, squid, shrimps and other dried seafood. Front: Papaya flowers. Back: Winter melon. Wild ferns; good if you know how to cook them. I don't. Wild rambutans. These are usually soft and sour. Now these are called rambutan kelapa or coconut rambutan. 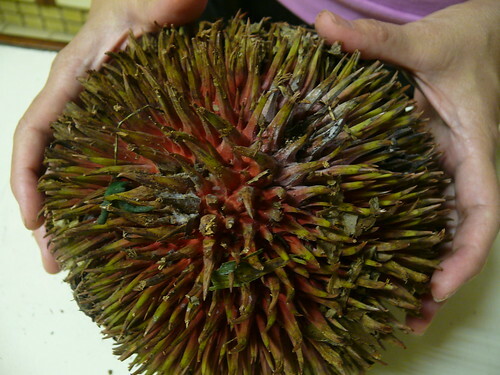 Three things you want in rambutans: the flesh should come off the inner seed, they should be sweet, and they mustn't be dry. 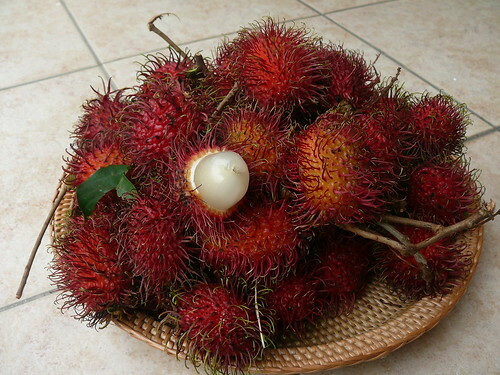 My China friend is surprised by the sweetness and crunchiness of these rambutans as the ones she has eaten in China were anything but. Of course these are good. They were probably just plucked off the tree in the early morning. That reddish fruit on the left is called buah hati (heart/liver fruit, prob. because of the color) while the one on the right is buah keju (cheese fruit, maybe because the texture is unusual, like cream cheese). The cheese fruit is tasteless, odorless, creamy and leaves a slightly bitter taste. 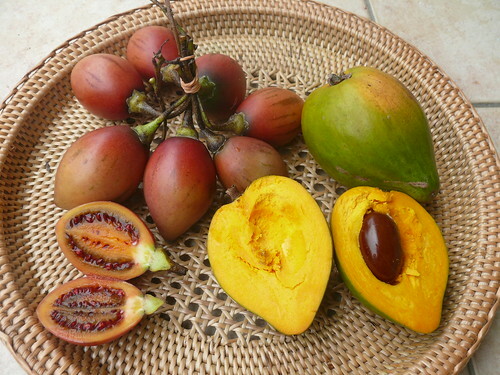 The heart fruit is good: sweet, sour and then, at the end a slightly salty umami taste, with a slight guava flavor. That's kaffir lime-lemon and the reddish fruit is called ribena so people boil it to make a clone Ribena drink. The real Ribena is supposedly made from blackcurrant although now that those two Kiwi schoolgirls have tested and found the drink to not have any vitamin C, it makes you wonder whether it is coloring and sugar all along. 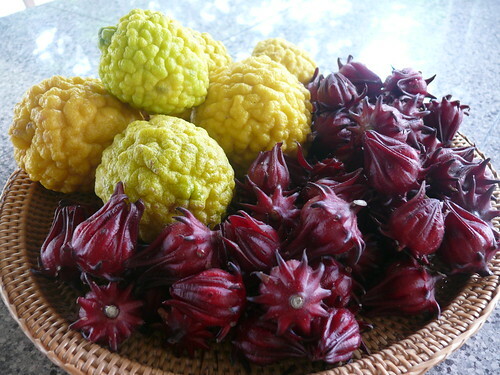 The fruit on the left is found only on Borneo Island. 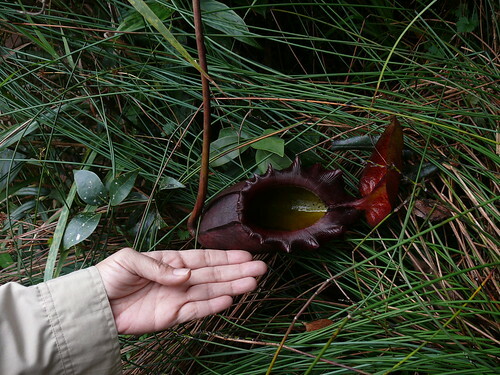 Called tarap, it smells like garbage but the pulpy flesh inside is sweet. Yummy. 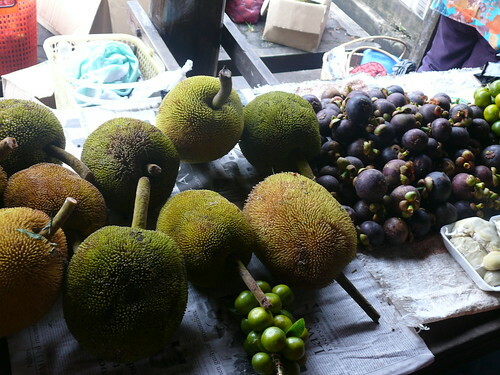 We get requests from friends and relatives to smuggle the unripe tarap (no smell when unripe) whenever we go to Singapore. That's mangosteen on the right. Another yummy tropical fruit. 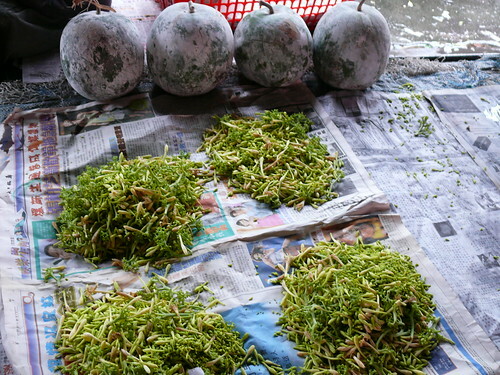 Tropical fruits lack 'finesse' and looks compared to temperate fruits but they win in intensity and variety of flavors. 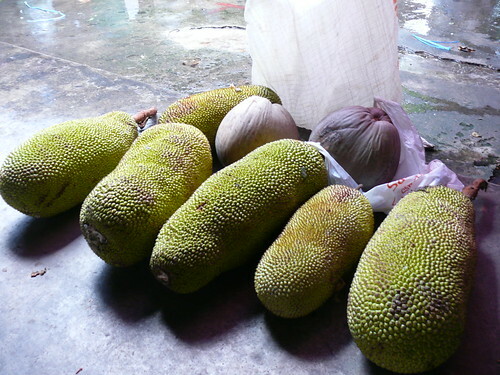 These are wild durians from the jungle. They all have about the same slightly burnt durian flavor. The dark orange one can sometimes taste of peanut butter. Of the three types here, I found the medium orange type to be the best. As it was about to rain, I didn't have time to buy my favorite wild durian which has a more distinct wild durian smell and taste, with thick flesh and small seeds, but you can read about it here. These wild durians are so creamy (many people are thrown off by not just the smell, but by the creamy texture as versus crunchy/soft texture of most fruits), two or three is enough to make you feel full. The dark orange one especially is so dense and thick it is like eating hardened cream. My friend from China found it "quite pleasant, not at all as bad as what people say about it." When I was eating these by myself this afternoon, I just praised God for giving us durians! Not exactly a beauty-contest winner (imagine the flesh in brown color--you know what I mean!) but it is absolutely delicious and lovers of this fruit would blow all their money just to eat it. Thank goodness durians are seasonal fruits or we'll all go broke.